This week Dutch Dare Card Challenge is ready with a recipe challenge for you. I had fun making my card. I have used a hÄnglar girl and seated her on a sledge from Magnolia. is a wonderful colour for Christmas. The sentiment wishing Merry Christmas is from hÄnglar. Pearls from Kort og Godt, ribbon from Panduro. A bit of Stickles added here and there. The inside with a sentiment from Norsk Stempelblad. 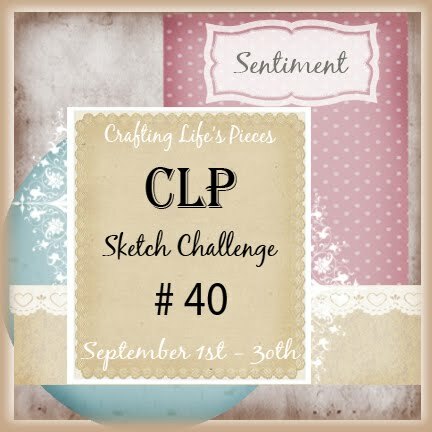 I have used this beautiful sketch from CLP. Wonderful card. Thanks for joining us at Christmas Inspirations challenges. Hope you will play with us again soon. Flot, flot kort. Og sjovt at Maja nu pludselig ligner julepapir. Det ER nu altså noget lækkert papir. Den (runde)kantpunch med krystaller er da vist ny.....og rigtig flot. Your card looks gorgeous. I really loved it. your card is wonderful Dorte! This is so beautiful. Thanks for joining us this week at Christmas Card Challenges. WOW...this is an amazing creation....love the papers and the magnificently colored Haenglar girl! So pretty! Love the purple tones! Thanks so much for joining us at CCC this week! Super cute, love the purple! Thanks for playing along with Christmas Crafting!